Weddings. What does the word itself conjure up in your head? A blushing bride lifting her veil to stare into the eyes of the man of her dreams? A slow and sensual first dance under the watchful eyes of loving guests? Gasps and tears of joy at the first kiss as a married couple? Yeah, I thought so. But, what about all the stress and problems before you get to the day itself? Yeah, not so glamorous is it? Well, Bolton Old Links Golf Club is an attractive venue, used regular to host weddings. And it has teamed up with another of our members, Love & Cherish, to organise the Weddings & Occasions Showcase. The day will see many exhibitors demonstrating and parading their products and services. There'll be photographers showing their portfolios. Dress makers and sellers flaunting their latest desirable designs. Wedding planners offering consultations and ideas. And room decorators, like our very own Love & Cherish, demonstrating how exquisite your room could look. And it will all take place in one of Bolton's finest wedding locations, Bolton Old Links Golf Club. Bolton Old Links Golf Club is a premier golf course with 18 challenging holes, beautiful views across the local countryside, a wide range of membership options and state of the art function facilities. Love & Cherish is an online store creating handmade wedding stationery to add a touch of luxury to your special day, without the luxury price tag, whilst also offering room decorations and wedding planning services. 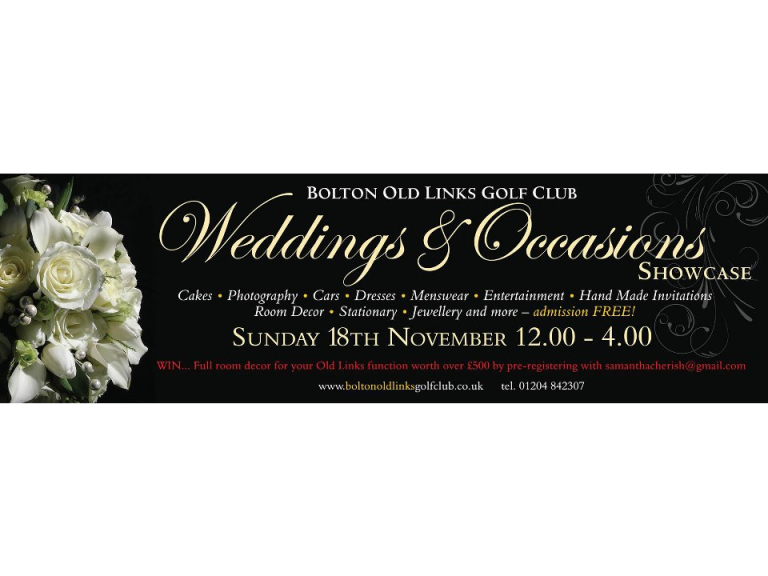 So, if you're planning a wedding and want all the services on offer under one roof, or are looking for some inspiration whilst you wait for the man in your life to take a hint and propose, get on down to Bolton Old Links Golf Club on Sunday 18th November between 12pm and 4pm. More details can be found in the links above.